The broad-based consulting experience of Quincy Capital Partners collaborates with you to manage, measure, and implement cost-effective solutions. An innovative financial sales professional, he has over three decades of experience in distribution of mutual funds, separate accounts, college savings plans, ETF models, and 401k plans. He has built teams as a divisional and national sales manager. Having developed and maintained numerous long-term relationships with clients, Paul connects the independent wholesaler to independent asset managers. His strong practice management skills have enabled many wholesalers and advisors achieve success. Prior to founding Quincy Capital Partners, Paul served as a Managing Director for Claymore Securities and was a top-performing wholesaler at Sentinel Investments, Putnam Investments and MFS. He holds FINRA Series 24, 6, 7, 63 and 65 securities licenses. Paul graduated with a B.S. Double Major in Finance and Management from Providence College, Providence, RI. A native of Quincy, MA, he now resides with his family in Sleepy Hollow, IL. 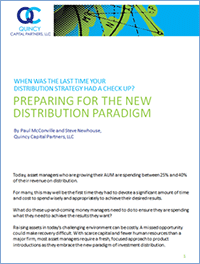 When was the last time your distribution strategy had a check-up? Chances are you are overdue. Please register with us to download your copy of Preparing for the New Distribution Paradigm to see how you are measuring up against your competitors. Any information provided has been prepared from sources deemed to be reliable, but is not guaranteed to be a complete summary or statement of all available data necessary for making an investment decision. Past performance is not a guarantee of future results. Price and yield are subject to daily change and as of the specified date. Any information provided is for informational purposes only and does not constitute a recommendation. Please consult your financial advisor for suitability, risk analysis and other financial planning suggestions. All rights reserved.